Nader Mikhail is the Founder & CEO of Elementum, real-time supply chain platform unifying procurement, logistics, manufacturing, & inventory operations. 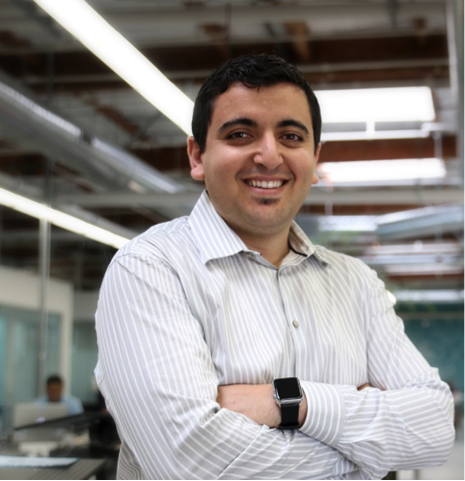 Nader draws upon over 15 years of supply chain experience at McKinsey and Flextronics, and has degrees from UC Irvine and Stanford University. Nader: In my opinion, the most successful entrepreneurs combine a relentless drive to win with a deep personal humility. This isn't easy, and requires that you clearly articulate a guiding vision that you, your team, and your customers can all believe in--even when things get hard (and believe me, they will). A wonderful mentor and accomplished entrepreneur once shared with me that a company's character is defined during that very painful transition of defining the vision, to executing on it with the first few customers. Entrepreneurship is not for the faint of heart! Nader: I'm definitely most proud of the "light-hearted, sure-footed, pioneering" environment we've created here at Elementum. I strongly believe that culture is a company's biggest sustainable competitive advantage, and from the first days of Elementum's existence, have been focused on removing obstacles to promote collaboration and personal initiative. Our building is a completely open floor plan. No one has an office. The conference rooms are all glass and the desks are all whiteboards. Anyone can ask any question, anytime, to anyone. The best ideas win, and when they don't--we learn together, laugh together, then get it right the next time. If you could do something over in your life, what would it be? Nader: Nothing. And I mean that sincerely. That's not to say I've never made a mistake, but life's too short for regret. Go all in, and understand that means you're going to fail. A lot. Learn from it and grow. Down the line, you'll understand how each "setback" was really a launching pad. And if you can trust in that, you'll save yourself a lot of unnecessary doubt along the way. Tell us about an instance where you had to go against the flow to realize your goal. Nader: When I was serving as the VP of Innovative Solutions at Flex, I had a tough time grappling with the inefficiencies of the global supply chain. I saw how much stifled innovation stood in the way of progress throughout every industry across the world. I was tasked with evaluating possible vendor solutions, but none that existed were actually solutions--they were just perpetuating the problems that already existed. But it wasn't as easy as saying, "Here's what we need to do." There were huge psychological and organizational hurdles to overcome. There still are. The industry is used to working in a very particular way, with the (false) assumption that companies completely control their supply chains, and the (backwards) incentives that punish instead of reward information-sharing. Neither of these problems could be solved from within Flex--or any single product company--for that matter. What I realized was that in order to solve this problem for any company, we would first have to solve it for every company. The traditional IT approach of working from the inside-out was actually counter-productive, and ignored the reality that supply chain has always fundamentally been a multi-company, multi-industry problem. The solution would have to be an outside-in one. We'd need to map every supply chain across the globe. We'd need to build the world's Product Graph™. So, driven by a determination to solve this massive challenge, I left my job at Flex to create a company that would eliminate both the siloed software systems and siloed organizational structures that prevented supply chain from realizing the benefits of modern technologies. A company that would help the elements of the global product economy move with frictionless momentum. A company we'd aptly name Elementum. What is Elementum doing that's truly unique in the space? Nader: Elementum maximizes supply chain velocity through the world's Product Graph™--a digital mapping of the $25T global product economy. This provides companies with the real-time supply chain information they need to make better decisions, faster. Elementum's global insights and cross-functional issue management enables companies to take days out of their supply chain, unlocking hundreds of millions of dollars of free cash flow for our Global 500 customers. Nader: I've always lived by the motto: Life is short, so go big. I get restless if I don't have a big, audacious challenge in front of me. If I can look back at the year and honestly say I exceeded my own expectations, I call that a win. If you were to give advice to your 22 year old self, what would it be? What do you know now that you wish you knew when you were graduating from college? Nader: In my years since earning a bachelor's degree, I've developed an analogy regarding my career and personal life: Screw the ladder. Knock it over and climb the damn wall. When you enter the workforce, you'll find that most organizations (particularly larger ones) have an existing structure, and an established path for progression; steps in your career path that lead to titles...that correlate to responsibilities...that lead to...well, more steps. But what if your aspirations don't lend themselves to that linear progression? Find a mission to commit to, embrace it with humility and relentless dedication, and you can accomplish things that no one could expect or predict. It might take a little more effort and determination, but you'll end up reaching heights you didn't think were possible. Just don't confine yourself to the ladder--climb the damn wall. Follow Nader Mikhail at @NaderKMikhail, check out the other interviews in Going Against the Flow series at http://www.huffingtonpost.com/charu-sharma/ and join this movement to empower 1 million female entrepreneurs on goagainsttheflow.com.